BLACKFIRE Wash & Wax is designed to provide a production level detailing look in a simple and quick washing process. This concentrated formula will allow you to tackle the difficult dirt and grime that collects on a car's paint with ease. Not only will BLACKFIRE Wash & Wax provide a thorough clean, but it will also leave behind a durable level of carnauba protection. BLACKFIRE Wash & Wax also rinses away easily due to the carnauba content and the water beading capabilities it instills on your paint. You will easily be able to boost and maintain the protection level of existing protection products with weekly maintenance washes using BLACKFIRE Wash & Wax. When BLACKFIRE was re-introduced as a car care line catered to professional detailers, we just knew there would be a high-quality wash and wax in the new line-up � it just took us a while to find the right one! BLACKFIRE needed something with enhanced slickness to deter dirt and mud from taking up residence on your paint, as well as something that would create a deep, crystal shine. And don�t forget about longevity! But it�s finally happened � BLACKFIRE Wash & Wax! 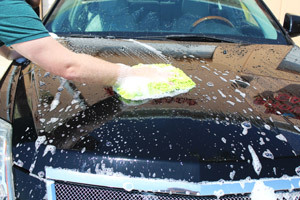 BLACKFIRE Wash & Wax is high-foaming and provides more than enough lubrication to safely remove dirt, dust, and other harmful particles from your vehicle's painted surfaces without scratching! BLACKFIRE Wash & Wax is not your average wash and wash formula. 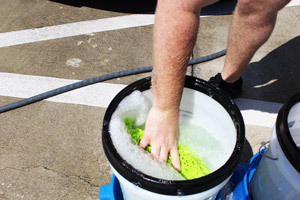 When activated, ultra-lubricating foam suds are created that help to fully encapsulate and remove dirt and dust particles from the surface of your paint, without harm or damage. And instead of just another run-of-the-mill, lower-quality carnauba wax, BLACKFIRE Wash & Wax features a polymer-infused carnauba wax that provides that carnauba shine you love, with the long-lasting effects of a synthetic ingredient. When you are detailing for profit, you want a product that will, 1. Save you money; 2. Perform well; and 3. Not take too much of your time! BLACKFIRE Wash & Wax�s advanced formula checks all of those boxes! Do not use in direct sunlight or on hot surfaces. Add 1-2 oz. 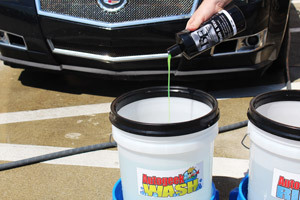 of BLACKFIRE Wash & Wax to 5 gallons of water and activate suds using a strong jet of water. 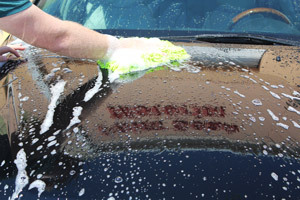 Use a clean wash mitt or sponge to wash the vehicle, starting at the top and rinsing frequently throughout. For best results, dry paint after washing. Detailer�s Pro Tip: Mix 2 oz. of BLACKFIRE Wash & Wax with half an ounce of BLACKFIRE Foam Booster and 6-8 ounces of water for use in a foam gun or foam cannon! Related Items - BLACKFIRE Wash & Wax 128 oz.